High Paying Jobs in Canada. 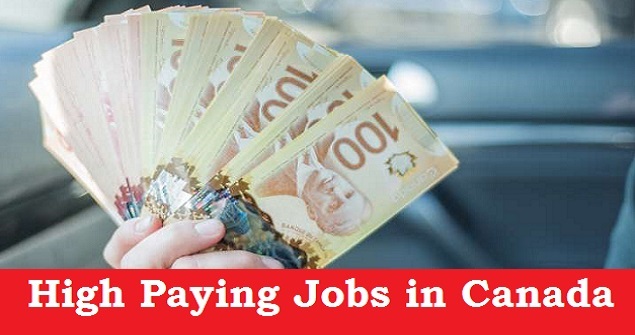 While Canada is a land of opportunity, with many well paying employment options, some positions pay a lot more than others, so when it comes to looking for employment vacancies, you might be interested in finding out which are the highest paying jobs in Canada. Natural resources are a major part of Canada's economy, so it makes sense that management in these industrial sectors is a lucrative employment opportunity. Both mining and forestry are serious players in helping to keep Canada's resource economy on an even keel and therefore securing a role as a primary production manager in either of these fields will guarantee you an excellent salary. The pay scale reflects the responsibility of the position, which involves the handling of hundreds of workers and complex technical knowledge, so it is no surprise that this position boasts salaries of around $108,000 per year. In order to obtain a role like this, you will require an engineering degree together with considerable experience within the industry. In recent times, the importance of a high quality human resources department has become more widely recognized and now management positions in this sector are among some of the best paying jobs in Canada. Essential in both private and public sector organizations, human resources managers promote a good workplace culture and boost productivity within the company. To obtain a position of this nature requires a degree level education, preferably with post graduate study in a relevant field followed by several years of working up the human resources pay scale. Salaries start at a fairly modest $30,000 at a smaller firm, but can rise to six figures with a high profile company. More and more Canadians are choosing to attend universities in order to benefit from the high quality of education they provide and so there is always a need for talented university professors. This is also a high paying industry, with the average salary being around $85,000 per year however this depends on the field of study with the medicine and business sectors commanding the best pay. Securing a position in this field is not easy, however, as successful candidates will have studied extensively in their subject, having obtained a doctorate qualification as well as any other licenses or professional qualifications necessary to the post. A surprisingly well paying employment sector, the demand for registered nurses is growing in Canada thanks to the ageing population. There is already a shortage of qualified candidates and this number is set to grow to 60,000 within the next ten years, so salaries are on the rise. With starting salaries of around $60,000, this amount can rise by $20,000 after gaining further experience. To become a registered nurse, you must first complete a degree course in nursing which requires four years of study. High Paying Jobs in Canada. Although engineering in general is a lucrative field, there are some areas of this discipline that pay better than others. Those who are qualified in specialized fields of engineering can command very high salaries of at least $80,000 with some fields offering at least $20,000 more. The most well paying engineering areas include marine engineering, petroleum engineering and bio mechanics. In order to secure a post in this sector, you will need a good engineering degree in your chosen specialism.